Driving in Johannesburg can be challenging. The every day conversation at work is about how bad traffic this morning was. And seriously, traffic can get really tough here. In Amsterdam we knew that you had to leave before 7.30 in the morning to avoid traffic. But we can’t figure out such a ground rule here in Johannesburg. This is not the main point of this blog, though. This blog is not about the taxis either, although they do drive like crazy. It is about how South Africans use the roundabouts. In South Africa you have a lot of four way stops. I had to get used to them, but they work quite well. For the ones who don’t know how it works: There is a crossway, the first car gets way, then the next and you just take turns. So one by one the cars cross. When traffic lights are off, which happens often, everybody waits patiently for their turn. But when it come to roundabouts, South Africans have no clue how that works. They treat roundabouts as if they are four way stops. Which means that they don’t give way to right and won’t go on the roundabout with more than one car at the time. And if you use the roundabout as you should, people angrily flash their lights at you, hunk the horn a few times and look at you as if you’re out of your mind. We are not the only ones who noticed the odd usage of roundabouts. 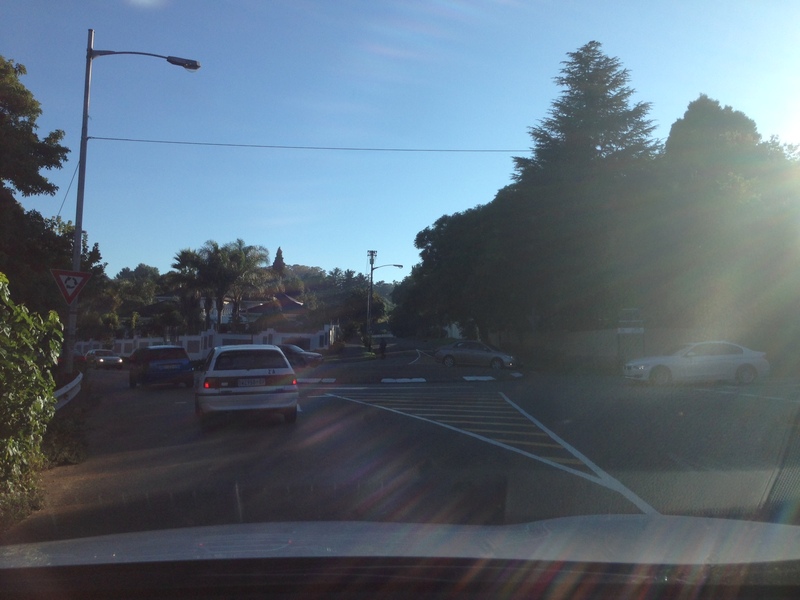 In our weekly paper in Melville, a discussion has been going on for a couple of weeks now on how to use the roundabout. I don’t think the discussion in the paper will help now, but maybe someday people learn how to use it. 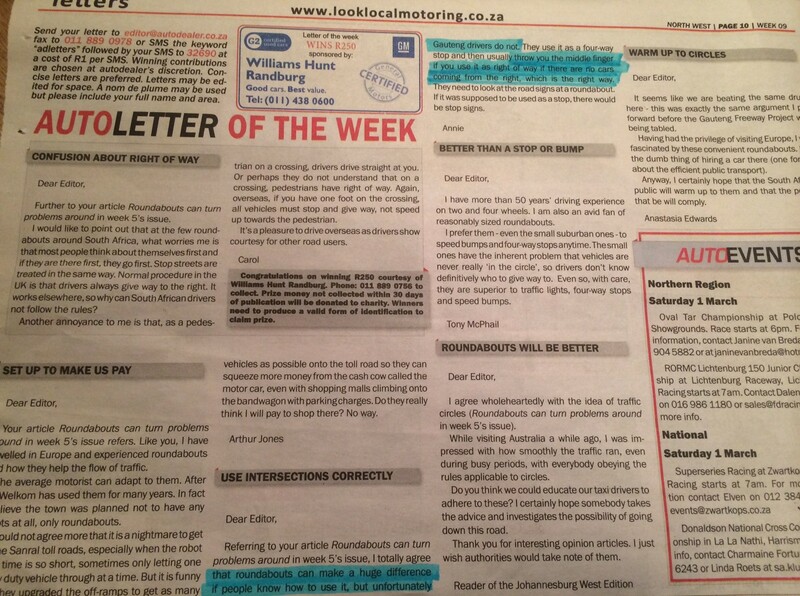 One page of the many weekly pages with letters from residents about how to use a roundabout. Obviously the roundabout only wins when people use it properly. Time to embrace the roundabouts, South Africa! Thanks! And now we need to figure out how to spread the word. I wonder if the size of South African roundabouts has anything to do with the way people use them. In small roundabouts, the way SAns use them works okay. But when SAns use bigger roundabouts their approach causes confusion.